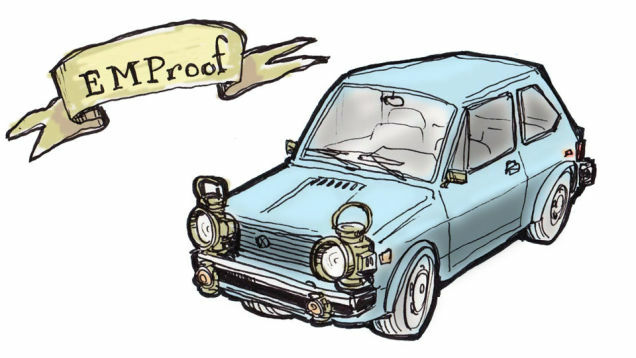 Last week, we were sent to a Craigslist ad where someone was trying to sell their old, sitting for “several years,” farm use-plated, Diesel Jetta by pitching it as an “EMP Proof” vehicle. First of all, a farm use Jetta? Did the pigs use it to commute to their day jobs telemarketing? EMP stands for “electromagnetic pulse,” and it’s essentially a big burst of electromagnetic radiation, which we know as electricity, magnetic fields, radio waves, WiFi, and all manner of other pulses and waves and whatnot. The British called this same phenomenon “radioflash,” which sounds way cooler. It’s a commonly used device in sci-fi, including the upcoming show Revolution, which features an EMP-like device shutting off all the world’s electronic devices. Can it really happen? How can you prepare your car? Should you even bother? The seller of the aforementioned car suggests the Jetta is especially EMP-proof because it “does not have what is considered sensitive electronics to run the engine and it has mechanical fuel injection.” While this is arguably true, it made me wonder about exactly how sensitive cars are to electromagnetic pulses, and, if I really am worried about an attack by an EMP device or phenomenon, what I can do. EMPs are most commonly known to come from nuclear blasts, though they are possible to generate independently. Early nuclear testing anticipated the EMP, and shielded electronics accordingly, since the main effect of an EMP is that electronic equipment can be disabled or permanently damaged. Ever since the 50s, when nuclear war panic and doomsday fantasizing and preparing began, the effects of an EMP on our modern electronic technology has been studied, with varied results. We’ll focus on cars, though, because that’s why we’re here. The common wisdom is that in the case of an EMP, most cars since, say the 80s and up that rely heavily on engine management computers will be severely disabled, likely permanently. I’ve tended to believe this myself, and the concept has been the foundation of a recurring frustration-daydream I have when stuck in traffic: A nuke detonates in the sky, sending a massive EMP propagating throughout the city. Almost all the cars around me are fried, leaving me in my archaic Beetle free to drive around and over the poor bastards, getting to wherever I was going unimpeded. Except for the inconvenience of the nuke itself, which never factors into the daydream. We tested a sample of 37 cars in an EMP simulation laboratory, with automobile vintages ranging from 1986 through 2002. Automobiles of these vintages include extensive electronics and represent a significant fraction of automobiles on the road today. The testing was conducted by exposing running and nonrunning automobiles to sequentially increasing EMP field intensities. If anomalous response (either temporary or permanent) was observed, the testing of that particular automobile was stopped. If no anomalous response was observed, the testing was continued up to the field intensity limits of the simulation capability (approximately 50 kV/m). Automobiles were subjected to EMP environments under both engine turned off and engine turned on conditions. No effects were subsequently observed in those automobiles that were not turned on during EMP exposure. The most serious effect observed on running automobiles was that the motors in three cars stopped at field strengths of approximately 30 kV/m or above. In an actual EMP exposure, these vehicles would glide to a stop and require the driver to restart them. Electronics in the dashboard of one automobile were damaged and required repair. Other effects were relatively . Twenty-five automobiles exhibited malfunctions that could be considered only a nuisance (e.g., blinking dashboard lights) and did not require driver intervention to correct. Eight of the 37 cars tested did not exhibit any anomalous response. Based on these test results, we expect few automobile effects at EMP field levels below 25 kV/m. Approximately 10 percent or more of the automobiles exposed to higher field levels may experience serious EMP effects, including engine stall, that require driver intervention to correct. We further expect that at least two out of three automobiles on the road will manifest some nuisance response at these higher field levels. The serious malfunctions could trigger car crashes on U.S. highways; the nuisance malfunctions could exacerbate this condition. The ultimate result of automobile EMP exposure could be triggered crashes that damage many more vehicles than are damaged by the EMP, the consequent loss of life, and multiple injuries. So it looks like most cars would not be seriously affected. This is largely the result of a car’s wiring and electronics already being pretty well shielded against electromagnetic interference (so you can, you know, still listen to the radio and not the noises made by your fuel injection computer) and because your car can act a bit like a big Faraday cage. On a very basic level, a Faraday cage is a conductive enclosure that causes electromagnetic force to travel along the outside of the structure and leave what’s inside mostly alone. Lurking on survivalist forums, I did learn that a microwave oven can make an excellent Faraday cage, so that’s where you want to jam your laptop and iPhone if you think an EMP attack is coming. Just remember to remove them prior to your celebratory false-alarm burrito. Now, this isn’t to say every car will be just fine in every case. The Discovery Channel showFuture Weapons drove a Taurus right under an EMP device, and it seemed to kill the ignition system, though ancillaries like dash lights and power windows remained working. This result makes me wonder exactly what the damage was— could a fuse have popped from the overload and spared the more sensitive parts? It’s not really clear. 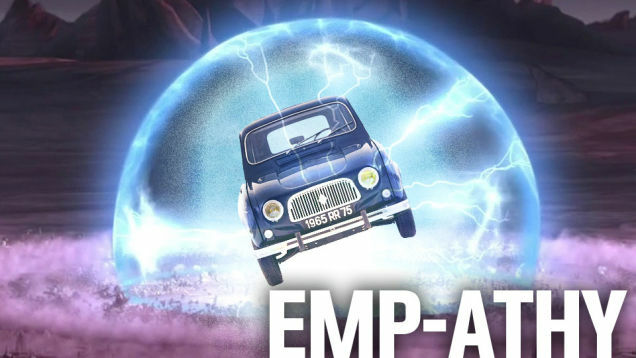 Just to make things more confusing, there’s been EMP devices made specifically for car-disabling purposes, like this one covered by our pals at Gizmodo. I’m sure these focused-EMP devices work, at least some of the time, but it is telling that we haven’t heard much follow-up to this, even though this story is a couple years old now. The plans to miniaturize it to handgun-sized seem ambitious, but plausible. I suspect the effectiveness may not be as great as they were hoping for. I’m partially suspect because in the video disabling the car’s “microprocessor” is mentioned, as though there’s only one— cars actually have a great number of distributed CPUs, handling many different things. Still there’s always the possibility of something getting fried, even though the most comprehensive testing seems to indicate it’s pretty unlikely. If you’re really, really paranoid, then an ideal EMP-proof vehicle actually isn’t too far off from what our Craigslist guy who started this whole thing is selling: some sort of older diesel. Since diesels have no ignition system at all, they don’t really have to worry about any sort of electromagnetic frippery, and a diesel can be made to burn almost any kind of oil, so it’d be useful for the likely troubled times to follow an EMP event. I’d probably go for an early Rabbit diesel with big lanterns to replace the headlights. And maybe smaller amber lanterns for the turn indicators, though I’m not crazy about running in and out of the car to turn them on and off to blink. For your regular car, the easiest protection is to park inside a giant Faraday cage, like a metal garage. Beyond that, I wouldn’t lose sleep over it.